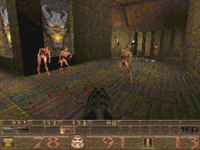 A screenshot of the Quake game. Taken from the Wikipedia article on Quake. This page was last modified 12:48, 2 December 2005 by Andrew Wilkinson.